LXC, or Linux Containers, is a system built upon a number of features included in modern Linux kernels that allows for creation and management of many virtualized Linux systems on a single parent host system. However, unlike some virtualization solutions, no hardware emulation is used and the container shares the kernel with the host, which makes LXC incredibly lightweight and easy to get started with. Also, due to its reliance only on mainline kernel features, LXC can be used within the KVM images on DigitalOcean. Security - By running key services within separate containers, you can ensure that a security flaw in one will remain better isolated from affecting other services. This may sound very similar to chroot jails, but LXC offers much more than just file-system isolation. Portability - LXC containers can be zipped up and moved to any other host with the same processor architecture. This works great when your scaling your application, as individual services can be duplicated or moved with ease. Limits - Due to its use of Linux cgroups, LXC containers can be configured with limitations on resources. When running a large number of containers, this can ensure that the most important ones get first priority. Note: The following tutorial expects that all commands on the host be executed as the root user. Warning: Do not attempt to use the following tutorial on a Debian system. Despite their similarities, the Debian LXC packages have a number of flaws that prevent proper isolation between containers and their host system. You may notice that 'User namespace' is indicated as missing; ideally it should be enabled, but LXC will still function without it for the use cases proposed in this tutorial. This command may take a few minutes to complete the first time, as it downloads and caches all of the required components. However, it'll eventually return and you'll have a very minimal Ubuntu install created with debootstrap in a new container. Note that the assigned IP belongs to an internal bridge, meaning that the containers are not accessible from your external DigitalOcean IP but do have access to the internet. In the next section, we'll look at port-forwarding to allow services within the containers to listen on the public VPS interface. This will enter you into a regular login prompt running for the container, where you can use the username/password combo given during the creation of your VPS (ubuntu/ubuntu). It is recommended though that you change this default password for any containers that will host internet facing services. Once logged in, you have a regular bash prompt from which you can do almost anything you would on the host machine. As this is such a minimal install, you may notice that some of the tools you use are absent, but these can be installed through apt-get if required. When you are done exploring your new container, you can exit its console and return to the host by typing Ctrl-A followed by Q. 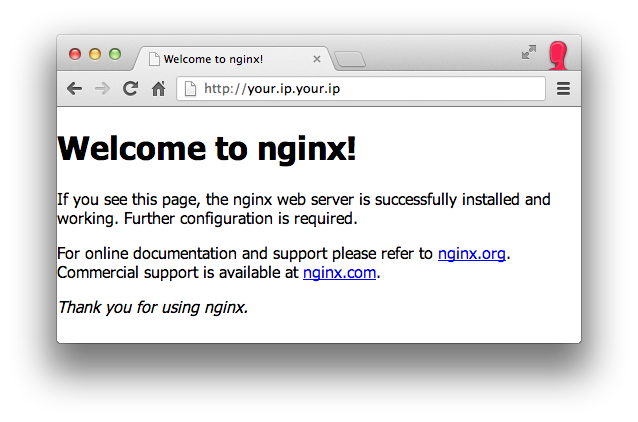 As an example, we'll install nginx in our container and make it accessible from the internet. Our container is effectively running its own Ubuntu VPS instance, meaning installing a service is much the same as installing on the host itself; therefore many of the tutorials here on DigitalOcean should work great even in the container. This will install nginx and ensure that is is running, but we cannot yet access it from the host's public interface. You can see this is the case if you navigate to http://your-DO-ip and note that it'll not yet be responding. As mentioned earlier, the containers are given IPs in a private range which operates behind a NAT and are hence normally inaccessible from the internet. This is similar to how most home networks operate, whereby all computers share one IP on the gateway. This setup allows all of the containers access to the external network but port-forwarding is required to expose services on the containers to the internet. Looking again at lxc-ls --fancy output from above, we can see that our container was assigned the private IP 10.0.3.143 (this'll likely be different for you). By adding an iptables rule to the prerouting table, we can forward packets on port 80 to our nginx container's port 80. Note: If you already have a service on the host listening on port 80, this rule will forward all packets to the container (even when not running) and hence the host's service will be inaccessible. This process can now be repeated in new containers for any other service you wish to run. The benefit of this method is that if a security flaw is found and exploited in nginx, the attacker would be unable to affect any other services, such as your database, without first finding another exploit to escape the container. Besides just isolation, another massive benefit of using LXC is its ability to apply cgroup limits to the processes within a container. Limits for a container are defined in its config file, which for our container can be found at /var/lib/lxc/test-container/config. These shares are not linked to any physical quantity but instead just represent relative allocations of CPU resources, meaning a container with more shares gets higher CPU access priority. The numbers used are completely arbitrary though, so giving one container 10 and another 20 is the same as giving them 1000 and 2000 respectively, as all it tells us is that the second container has twice the CPU share priority. Just ensure you are consistent with your scale between containers. Once you've changed the cgroup limits in the config file, you'll need to shutdown and restart the container for the changes to take effect. It is often the case that you'll want the containers to autostart after a reboot, particularly if they are hosting services. By default, containers will not be started after a reboot, even if they were running prior to the shutdown. This will attempt to safely shutdown the container. Replacing lxc-shutdown with lxc-stop will perform an instant termination of the container, which is analogous to pulling the power plug on a real machine and may leave data in a corrupt state. Hence, use lxc-stop only in cases where lxc-shutdown fails. This has shown the basic life-cycle of LXC containers and how they might benefit your setup. If you need any further advice or assistance, leave a comment below.